A fully loaded 14-seater bus skidded off a bridge into a nearby river along Okogbe-Mbiama axis on East-West Road, Ahoada West Local Government Area of the state. It was gathered that three hours after the bus swung into the flooded river, none of the passengers were yet to be rescued, as attempts to rescue them proved abortive. The bus fell into the river while trying to navigate through the flood but unfortunately missed the track. The Nkpolu junction, a major access to the East West Road, has remained impassable. The flood has crippled business activities in the area and forced many residents out of their homes. The flood has also damaged the road by creating deep craters, thereby causing serious gridlock in the area. However, eight passengers in the submerged 14-seater bus have been rescued. Spokesman of the Rivers State Police Command, Nnamdi Omoni, who confirmed this, added that they were receiving treatment from a nearby hospital in the area. The Guardian gathered that the four councils in Orashi coastal area, including Ahoada West, Ahoada East, Ogba/Egbema/Ndoni and Abua/Odual submerged as flood hit the area recently. Ahoada West is said to be the worst hit, with the entire 71 communities of the council affected. Witnesses said that the flood surged into the Okogbe/Mbiama area of the popular East-West road of Ahoada West, covering a bridge on the river, thus making it difficult for motorists to know exactly where the road is. In an attempt to navigate through the flooded bridge, the 14-seater bus skidded off and plunged into the river with all its occupants, The Guardian learnt. His words: “I can confirm to you that a 14-seater bus plunged into a river in Ahoada West. The driver of the bus lost control before the bus fell into the river. In a related development, one person, a teenage girl, Miss Annabel Ugochi, has drowned as floods continue to ravage parts of Rivers State. It was gathered that a severe downpour coupled with the deplorable state of the road in Umusoya community, Oyiogbo Local Government Area of Rivers, caused the unfortunate incident. Findings by The Guardian revealed that the girl went missing after the downpour. The victim’s father, Mr. Hycient Uzo, said he returned home and discovered that his daughter was missing. He said after a thorough search, the girl’s lifeless body was found at night floating on the flood. The devastated father noted that the body of the deceased would be buried tomorrow. He lamented that contractors fixing the road channeled the water into the community without proper drainage. According to him, “flood has wrecked havoc in our area, destroyed our houses and farmland, Today, lives are threatened whenever there is rainfall”. Regrettably, flood has continued to ravage various communities in Rivers, making lives unbearable for residents with no concrete effort by the state government to remedy the situation. Already, area boys are taking advantage of the situation to have a field day. The thugs charge between N2,000 and N3,000 to pull out each vehicle that falls into the pothole. The situation has also forced the cost of transportation in the area to be hiked. Before now, a journey from Romokoro to Choba costs N100 but due to the flood and deplorable state of the road, the fare has increased to N200. The state government has, however, turned a blind eye to the ugly situation and offered any palliative or remedy. In another development, two persons, including the paramount ruler of Elibara community, Eze Oha Augustine Amadionu, have been killed in Elibrada, Emohua Local Government Area of Rivers. Eyewitnesses said Eze Oha Amadionu was shot dead by unknown gunmen along with a young man identified as Wayagbo Amadi. According to a source, paramount ruler was shot several times while Amadi was shut and beheaded. The source dismissed report that the murdered victims were cultists, adding that the killing of the two people has forced inhabitants to leave the community for fear of reprisal attacks. The Rivers State Police Command has confirmed the killing, describing it as unfortunate. Spokesman of the command, DSP Nnamdi Omoni, said a team of security operatives has been dispatched to restore calm in the community. Meanwhile, no fewer than 60 houses and historical sites have been destroyed by landslides at Anderson along Marina Street in Calabar, Cross River State. Also threatened are the palace of the Obong of Calabar, Edgerley Memorial Primary School and Primary Health Centre among others. Cross River is also at the risk of losing some historical sites such as the European Cemetery. Speaking at the erosion sites, the village head of Esuk Effiom, Dr. Effiom Ewa Ekeng Magnus Henshaw, explained that the area started experiencing erosion challenges over 30 years ago. 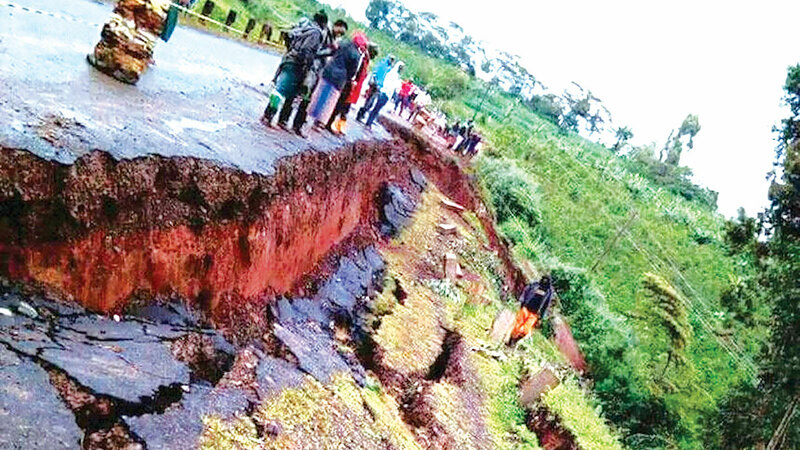 He said: “But for the intervention of the Federal Government in some parts of the sites, which helped to mitigate the impact of the landslide, the movement of the earth would have been devastating. At the moment, the gully site is expanding at a very fast rate”.